We had grand ambitions for Botswana. The goal was a drive from the Namibian border to the town of Maun (pronounced something like Mau-oon), gateway to the magnificent Okavango Delta wetlands area. It was a huge distance which would cover almost the entire country. 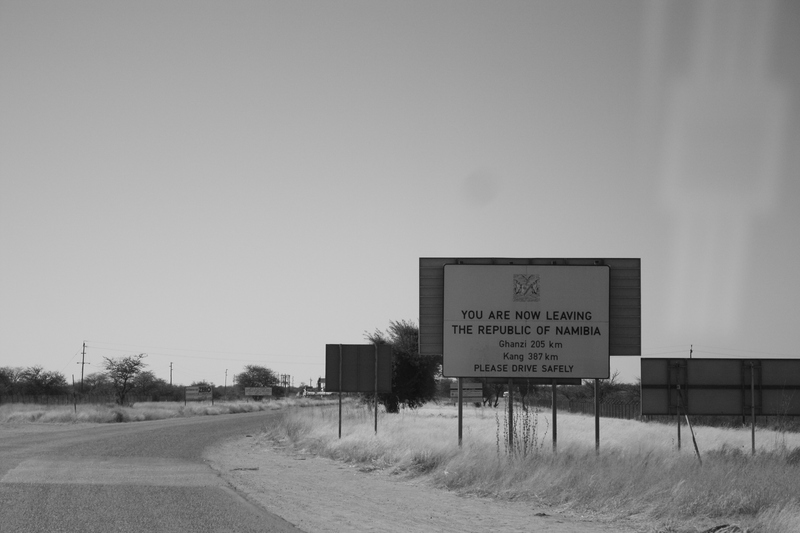 We spent the morning eating breakfast in the car and practicing some Tetswana words (hello, thank you, etc) which we had learned at the border, one of the predominant Botswanan languages. Learning just a few words made us feel more immersed in the world we were in. After several hours of gliding through southern Botswana on a smooth, straight highway, Jeff and I had decided on a shortcut to liven up the journey. (And hopefully to reach our lunch stop town of Ghanzi faster). The landscape was flat and expansive, rich brown soil spotted by endless clusters of spiny scrubland. 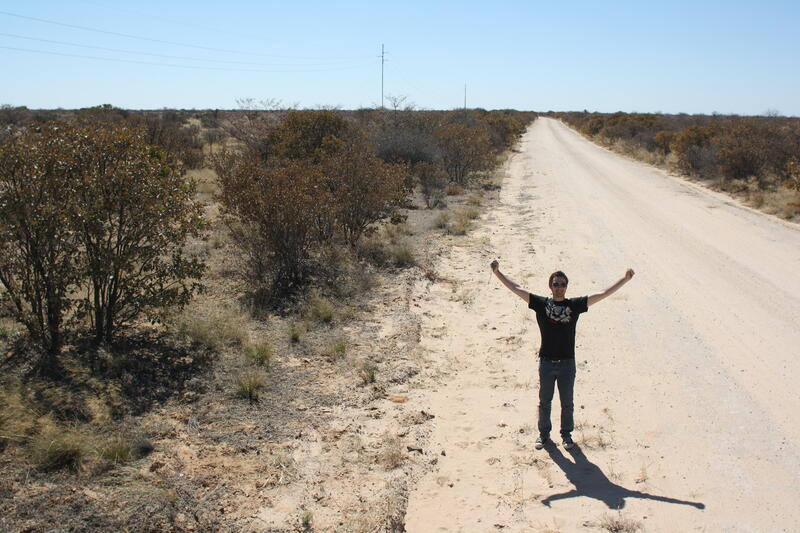 Somewhere near a tiny town called Tshoota, we turned off the highway and traded tarmac for dirt. 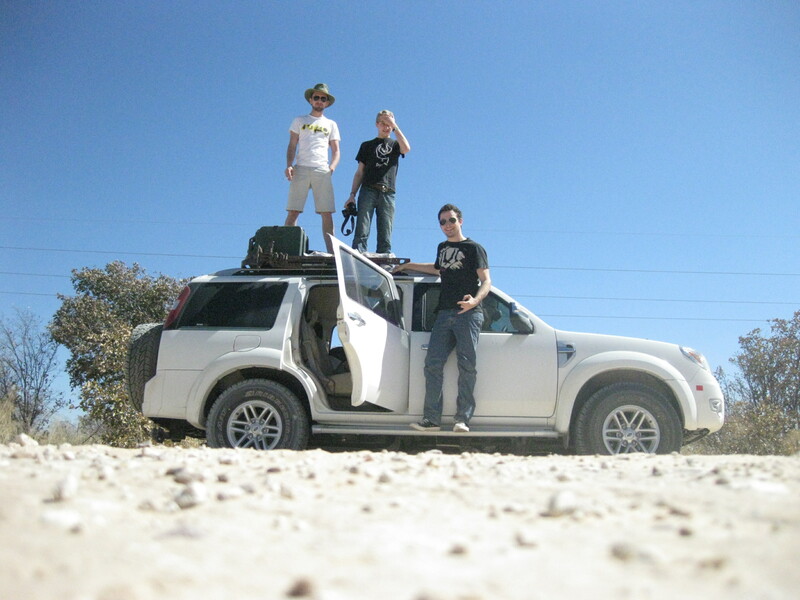 We reached Ghanzi a short time later, the car covered in a thin film of pale dust. The shortcut had been hot, dry and sandy, and above all, blindingly bright in the morning sun. Finding shade in Ghanzi was priceless. 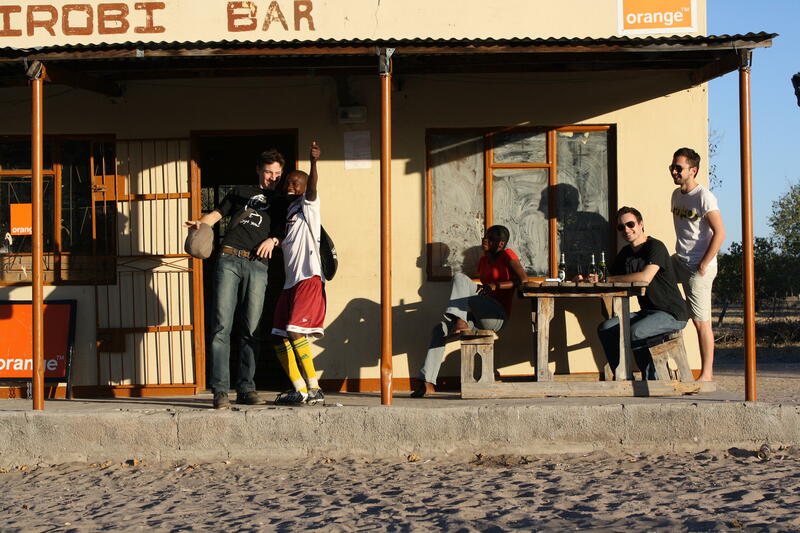 At the local bank, we traded Namibian dollars for Botswanan Pula, and immediately made our way to a bar which had been recommended for us. The long hallway was decorated with wooden figurines and paintings of African animals. 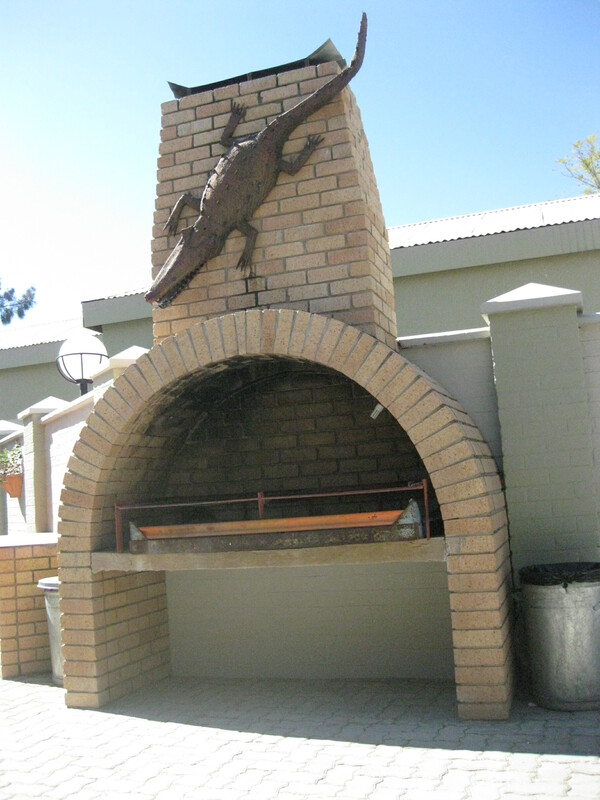 We sat in the beer garden, a brick courtyard with tables and umbrellas, and a brick outdoor oven with a big bronze crocodile sculpture hanging on the wall. We were the only patrons, and as such, received doting VIP service. With three cold St. Louis lagers (Botswana’s finest beer), and hot chips, we sunk into our chairs. There was still a lot of driving to be done. I took the wheel, while the others slept. This road was sealed and wide, flanked by large grassy sides and forests beyond. 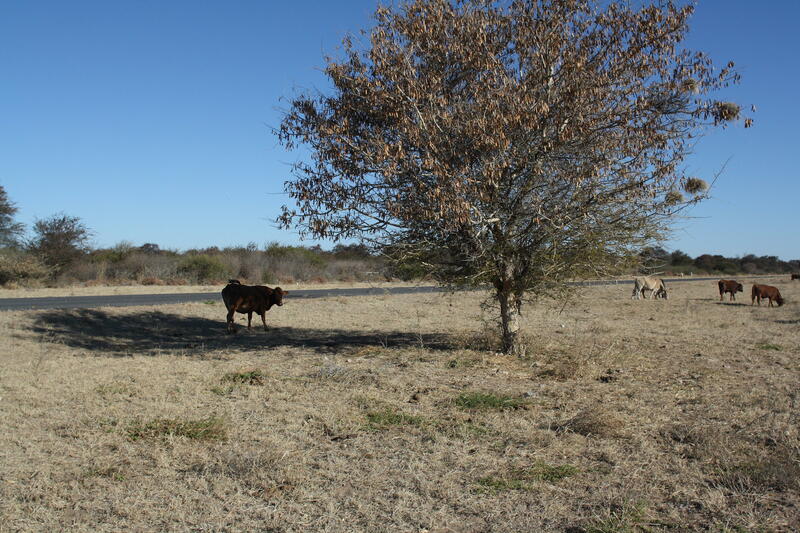 Herds of goats and cattle milled around everywhere, grazing, along with the occasional lonesome donkey standing by itself. I thought of Tina’s advice – don’t speed – and I could see why. Bulls with huge horns occasionally wandered across the highway as they pleased and without warning, sometimes lingering to watch the traffic build up in front of them, before deciding to move on. There was a heavy CRACK. At highway speed, a red-billed hornbill (like Zazu, the bird from the Lion King) had smashed with force into the centre of the windscreen, chipping the glass and making me jump. The bird rolled down the road, dead. The others were still asleep. 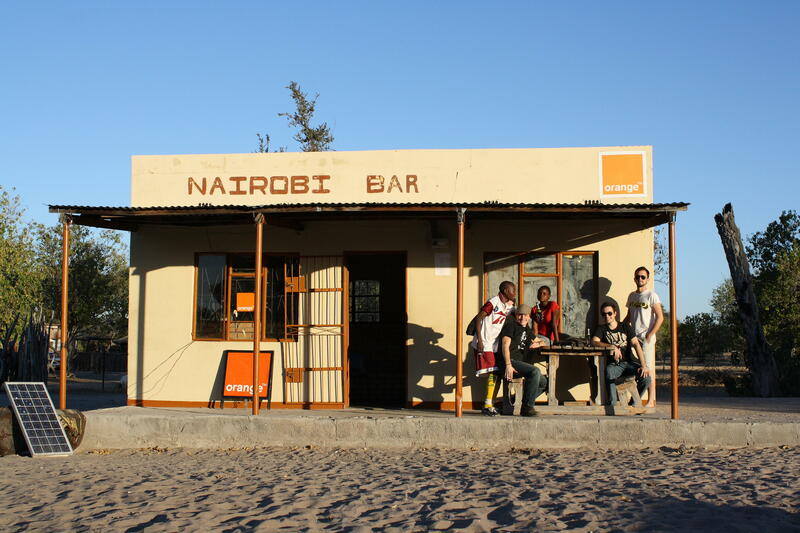 As we neared Maun, a sign flashed past us; hand-painted, home-made, advertising ‘Nairobi bar’. Sounds perfect! The distances we had driven were too long, and we needed to rest. Just off the highway, ringed by forest and planted in the middle of a gigantic sandpit, the bar was a squat concrete building. There were no doors and the windows were filthy and smudged, it was powered by a modern solar panel and plastered with colourful mobile phone advertisements (mobile phone ads seemed to be on everything in Africa). We walked up to the bartender, a young girl of 13 or 14, chewing gum as a speaker fired out ridiculously loud pop music. We ordered a round of Windhoek lagers and sat outside at a wooden bench. I pondered the name – Nairobi was a long, long way from Botswana. Oh well, TIA. As Wessel set up the tripod for a group photo, the bartender came outside out of curiosity. 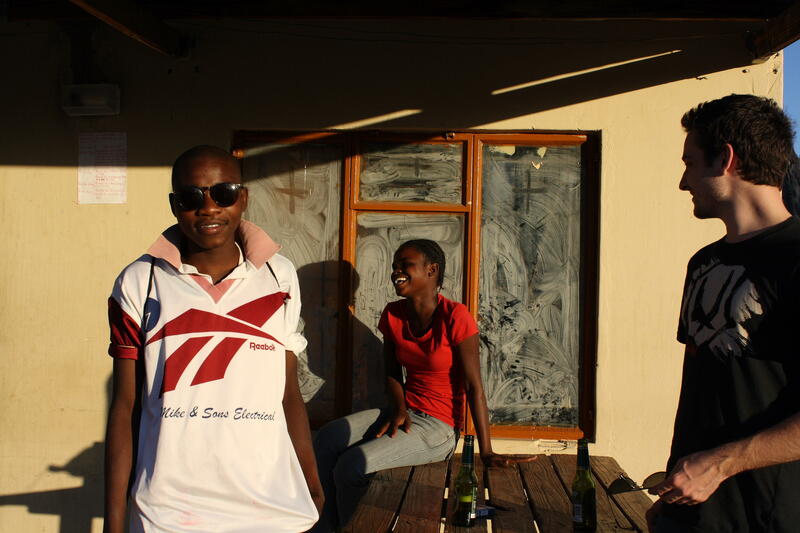 She spoke a little English and talked about her school and about life in Maun. Her older brother arrived from a garden path, having just finished soccer practice, sporting a soccer jersey and gripping a soccer ball under his arm. The 2010 World Cup had just finished, and I asked who his favourite player was. “David Villa!“, he quickly replied, one of the stars of Spain’s team. Truly the ‘world game’. The kids joined us in our group photos. The bar was great, and lived on fondly in our memories as an icon of our road trip. Nairobi Bar was exactly where we wanted to be. It’s crude simplicity, it’s unusual style, it’s weird location, it’s cold beers. As the sun set, casting rays of orange light through the filter of trees, we felt lucky to have found ourselves in such a unique place. It sounds like an awesome bar!! !